Patient satisfaction and quality of care are built upon a new foundation of patient engagement. In this new age you will be compensated for the level of engagement you create with your patients. As employed physicians become the majority in the United States, your organization will create a competitive advantage by building new levels of physician engagement with your providers. In this article, I will show you the single most important skill clinicians and physician leaders must learn in order to thrive in the years ahead. Why the "Age of Engagement"? Fail to achieve new levels of physician engagement and you will lose market share to organizations who do. We must abandon the top – down, command-and-control paradigm that unconsciously dominates the way physicians communicate. 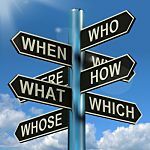 In its place the successful clinician and/or physician leader must begin to expand your ability to ask questions - a lesson we can all take from the executive coaching industry. Until we learn to replace the old paradigm of Order => Comply with Question => Engage our patients and our physicians will continue to suffer unnecessary levels of frustration and stress. Questions - NOT more orders - are the key to engaging both physicians and patients in this new age. Questions fundamentally alter the energy of a conversation. They place a new emphasis on the real decision makers – your patients and physicians. When you maintain this coaching – style flavor of interaction you create a context for true collaboration rather than simply giving orders and expecting the other person to meekly comply. ... the last time somebody told you what to do without giving you any options on why or how you would take this new action. How did it feel? What did it cause you to think about the person giving the order. It sends a clear message of clueless, distracted lack of caring. Let me show you specific stages of your interactions with doctors and patients where you can maintain your questioning mindset. These are stages in your office visits and your leadership conversations continuing to ask questions will fundamentally alter the level of patient engagement and physician engagement you create. You can continue to give your patients "orders" and expect them to comply blindly as if they were privates in the military -- and you a general. Even though this communication style is incredibly common it has never been effective. Only now are we finding how ineffective giving orders is - at the point of implementing a treatment plan. The new ePatients come to the office yearning to be engaged in the decision-making conversations that determine their treatment options. If you listen to patient complaints on the Internet they are almost always about the physician not allowing them to play a role. If you are ready to stop working so hard and let the patients co-create the treatment plan, here are some ways to get started. This is actually extremely simple. We know how to ask questions when taking history – even though studies here show doctors are not particularly effective at it. Don't stop asking questions when you begin to discuss the treatment plan. Remember you must enroll the patient in the benefits of their treatment plan FIRST - before they will participate effectively. Here are some sample enrollment questions. "What would be the benefits to you of treating your blood pressure?" "How would your life be different if you lost 20 pounds?" "If we could prevent another heart attack, what difference that would that make for you and your family?" When they can see clear benefits of the successful treatment of their disease process they will naturally be ready to engage in the actions required. Once the enrollment step is complete, continue to ask questions to engage the patient in the specific steps of their treatment plan. Your questions coax them into co-creating the plan so that you no longer have to give orders. Medication "compliance" is one place this becomes an obvious advantage. Rather than simply telling the patient to take a pill twice a day and expect them to obey this order, do this instead. "Joan, this medicine is meant to be taken twice a day. How are you going to remember to do that?" Then continue to ask questions to help her become clear on how she'll remember to take her pills. You start with her ideas rather than your orders. A higher level of engagement in her own care is an absolute natural result. You are co-creating the treatment plan and she is an enrolled and equally engaged participant. Before we talk about physician engagement it's important that I ask how much you and your organization actually care. Do you care about the working conditions for your physicians and other front line staff? Do you care about the quality of the workplace for your providers. My experience is that the majority of healthcare organizations do not care about their people. They care about patient flow or the bottom line or productivity – not about the people inside their systems. In fact, most healthcare organizations are not even aware of the stress levels and working conditions in their front lines -- outside of the grumbling they hear from the doctors and staff. Despite high levels of burnout, stress and turnover – the same organizations attempt to mandate higher levels of physician engagement by saying silly things like, "you people really need to be more engaged." Think about that for a second and you'll realize how insane this mindset is – as if physician engagement was a switch on the back of your doctor's heads they could flip at any point in time. Continue to ask coaching questions to your physicians. Allow THEM to tell YOU what support they need. The only reason an organization does not know how to lower stress levels in the front line is they are simply not asking their doctors. The simplest form of this question is, "how can we help?" However, instead of asking simple questions, most organizations do this instead. Send out multimillion dollar surveys -- that go on for 150 questions or more -- and the results are completely incomprehensible to the leadership team. If you want to know how to engage your physicians in the operations of the organization, simply ask them how you can help and GET ON IT. Remember too, your success in this initiative will depend on how much you honestly care about your people. Here's an example of a free physician survey created on Google Drive that will help you get on your physicians biggest problems within two weeks of its deployment. The answers to this survey will hand a complete project plan to your physician burnout prevention committee. It is everything they need for a running start on specific ways to improve the provider experience and build more physician engagement. - Creates a new culture in your organization where the physicians actually say things like, "you know what, it's beginning to feel like the administration around here has my back." I believe organizations who build this new level of physician engagement will construct a disctinct competitive advantage in the years ahead. Your patients will be able to tell the difference an engaged staff makes when they come in the door. They will have a higher quality experience with higher levels of satisfaction ... naturally and automatically. Your physicians will spread the word about how things are different in your organization. This is a place where they ask what we think and actually work to make our lives easier. What are YOUR favorite patient engagement and physician engagement tools?